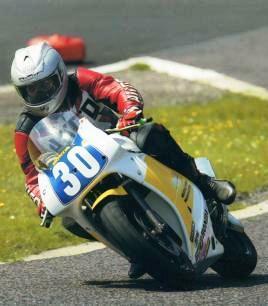 In 2009 I retired from art teaching [definitely] and motor cycle racing [maybe!] consequently I now have more time to devote to my own artwork. I trained at Carlisle College of Art before studying for my degree at Camberwell School of Art. After completing my post graduate year at Liverpool Poly. I went on to teach art at a variety of northern comprehenseless schools for the next thirty plus years. In the mid-eighties I left teaching for a time and started producing custom paintwork at a friend’s motorcycle shop in Widnes and the airbrushed examples on this site date from that period. Hopefully there is sufficient variety on these pages to illustrate a wide range of skills and techniques so unusual commissions are welcome. My interest in motorcycles has been lifelong [thanks to a dad dragging me off to the T.T. from the age of six] and after starting racing at the age of eighteen and having to give it up when my daughter came along I resumed my racing career in my mid fourties in 1995. I won the Preston & District Classic championship in 1996 and finished runner up in the 2000 U.K. Classic championship. I have produced artwork for many of the top personalities involved in motorcycle racing including Alan Shepherd,Fred Walmsley,Brian Richards,Rob Fisher and Alan Oversby.